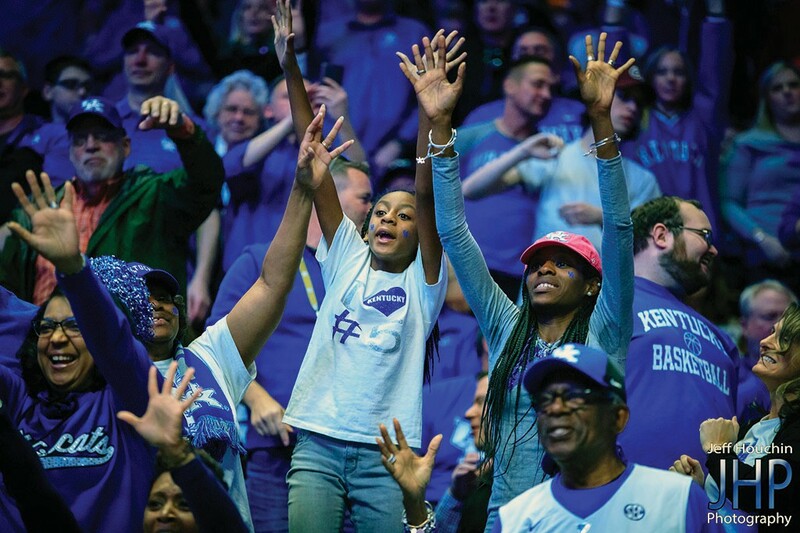 When Kentucky opens NCAA Tournament play in Jacksonville against Abilene Christian Thursday, it is a given that Immanuel Quickley’s aunt, Demetria Caldwell, will be there supporting the Wildcats. Actually, no matter where the Cats would have been playing, she was going to come. Caldwell was at the SEC Tournament in Nashville along with her mother, Quickley’s 10-yearold sister, Shiloh, and other family members. 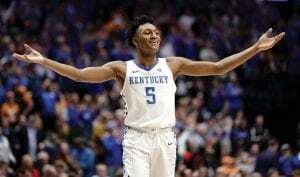 Nitrease Quickley, the UK freshman’s mother, is an educator in Baltimore where they live and didn’t make the SEC so she could hopefully attend NCAA Tournament games. Immanuel Quickley was glad to have his sister in Nashville watching him play. “I hadn’t seen my sister in a couple of weeks, so it was great to see her. She is playing basketball, too, and doing really well. I am proud of her and love when she gets to see me play,” Immanuel Quickley said. The Quickley family travels well. When he played in the Mc- Donald’s All-American Game in Atlanta last year, about 40 family members came on a bus from Baltimore to the game. When he played for Team USA in Egypt on a team coached by John Calipari, the freshman’s mother and grandmother were there. When he played for Team USA in Spain, his mother, grandmother and Caldwell all were there. His grandmother had to miss some games this year because she slipped on ice in Maryland and fractured her ankle. Turns out she was coaching a recreation league team for players ages 5-6 but was a player short at a game. Caldwell has liked what she has seen from her nephew this year. He started seven games early in the season but has settled smoothly into his role coming off the bench and playing either guard position. He’s averaging 5.5 points, 1.8 rebounds, 1.3 assists and 18.6 minutes per game. He’s one of the team’s top foul shooters at 82.8 percent. Caldwell interacts with all Kentucky fans that she can. She says her experience with the fans has been “amazing” all season, including the SEC Tournament. You can normally spot her in the crowd because she wears a pink UK baseball hat. The UK freshman says he can “definitely hear her” and some- times can make eye contact with her. Former Mississippi coach Andy Kennedy is now a SEC Network analyst and has watched Kentucky play often this season. He believes freshman point guard Ashton Hagans can be a significant factor in NCAA Tournament play when UK faces teams it has not played before this season. Kennedy said before the season started he talked to the Kentucky coaching staff about Hagans and they were all “raving” about him and the ways he could change a game. Kennedy says he never coached a player who can do the things Hagans can. Florida assistant coach Darris Nichols says Hagans has learned to just make the needed plays on offense. Hagans says his goal in NCAA play will be to just “play my game” no matter what. Because he verbally committed to Kentucky at the same time the Wildcats were beating Alabama in the SEC Tournament last week, 6-7 Indiana five-star Keion Brooks didn’t get quite as much attention as a top-ranked Kentucky commit normally does. However, he was a huge addition for Calipari after he had missed out on some top players in the 2019 class. The 6-7 Brooks plays for unbeaten La Lumiere, the No. 1 team going into the GEICO Nationals. He participated in the USA Basketball junior national team minicamp and will play in the Jordan Brand Classic and Allen Iverson Roundball Classic. He is ranked as the No. 4 small forward and No. 13 overall prospect in the 2019 class according to 247Sports and bumped UK’s class of Tyrese Maxey, Kahlil Whitney and Dontaie Allen along with him to No. 2 nationally. Brooks made an unofficial visit to UK in February to see the Cats beat Tennessee and that apparently gave coach John Calipari the needed edge over Indiana and Michigan State. Brooks made his decision public at St. Paul’s Lutheran School, his former middle school. Victoria Jacobsen of the The Journal Gazette reported many attending the announcement were wearing Indiana gear and there was a brief pause when he announced for UK before fans applauded his decision. Recruiting writer Chris Fisher of 247Sports says all the “stars aligned” for Kentucky after Brooks’s unofficial visit in February combined with Indiana’s late-season ski. “To get him on campus when Kentucky had is third largest crowd in Rupp Arena history and maybe the best atmosphere in year and beat the No. 1 team at the time was really huge,” Fisher said. “That put Kentucky in position to steal him late. “Kentucky obviously has a great need for bodies in the front court. He’s versatile and can do a lot of things. He shot about 35 percent from 3 for most of the (Nike) EYBL. I think the improvement of PJ Washington this year was enticing for him because they are somewhat similar players. You can give it to him on the perimeter and he can make a play getting to the rim or make a jumper. Brooks told Jacobsen that Calipari “lets his players play” and he liked that. “If you’re an athlete, and you can make plays, he’ll let you do that. He’s not going to hold you back and restrain you. … It’s how I play, and it fits my playing style the best,” Brooks told Jacobsen. Kentucky beat North Carolina in December in Chicago and could meet the Tar Heels again in the NCAA Tournament if both teams advance to the Midwest Region final in Kansas City. North Carolina is the No. 1 seed in the region and UK the second seed. Both teams have to win three games for that to happen and Calipari insisted he had not seen the Tar Heels play since December when the Cats beat them. “I watch ‘The Last Frontier, Life Below Zero.’ Anybody watch those? The whole time I’m telling my wife I can do that. She’s like, ‘Psshh you can’t do that.’ Building Off The Grid. Anybody watch that? I’m giving you stuff to help your culture. Obviously, Calipari was not wanting to talk about the Tar Heels knowing a rematch is a long way off with the upsets that occur in March Madness. “I’d like to have a life so I may turn on a game for five minutes and I watch it. I think I watched the Duke versus North Carolina game for about three minutes in the first half,” he said. “North Carolina, I think I was like wow and then they told me what the score was, and I said how in the world did that happen. Quote of the Week: “That’s just him being him at times during games. He is crazy but in a good way. I guess it is just basketball that gets him that way in a whole different level, but he is definitely crazy,” freshman guard Ashton Hagans on UK coach John Calipari. Quote of the Week 2: “The atmosphere was really unbelievable obviously. I couldn’t believe what BBN (Big Blue Nation) fans were like. They were just having fun and it helped make a long season a lot of fun here toward the end for us, too,” UK freshman guard Immanuel Quickley on the UK fans at the SEC Tournament.